A Release of Liability, or ‘Hold Harmless Agreement‘, is a legal document that indemnifies an individual or business entity from legal and/or financial responsibility. Although, this is usually limited to negligence on behalf of the party being held harmless. 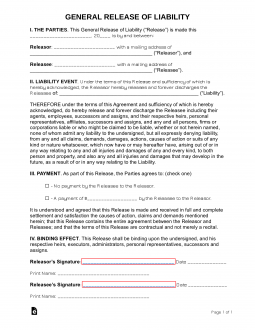 If the release is being signed after the event took place, such as a car accident, the releasor may be paid money to sign such an agreement. Car Accident Release of Liability – Settles a fault and any further legal or financial strain from an individual or company that was involved in a motor vehicle accident. Media (Video + Photo) Release – Allows a media company or any third (3rd) party to use video(s) or photo(s) for news publication. Medical Record Information Release (HIPAA) – Standard form requiring the sharing of medical records from a hospital/doctor’s office to other individual’s the patient deems worthy. Location (Event) Release of Liability – Most commonly used for school trips or activities where the group that is sponsoring it does not want to be accountable for any accidents that may occur while at the location or event. Photo Release Form – For the general purpose of using a person, entity, or any type of picture that is made commercial use. Real Estate Lien Release – This form erases any lien that has been placed on real estate by a contractor (mechanic’s lien) or any type of laborer. Social Security Release of Information (Form SSA-3288) – In order to allow a third (3rd) party representative to access an individual’s Social Security benefit information. Veterans Affairs Medical Records Release (VA Form 10-5345) – Use to release health care information being held by the VA to be transferred to another entity or individual. Video Release – Allows another individual or entity to use footage of someone else for any type of video publication. What is a Release of Liability Form? For any business conducting physical activity, whether it pertains to employees or customers, a Release of Liability Form is essential to have in order to protect your business from potential lawsuits. Lets say you operate a construction business that highly demands physical labor. There is a good chance that one day an employee might pull a muscle while handling construction material. Because this employee injured him or herself during normal operations, your company would not be at fault. However, if an injury were to result from negligence, a Release of Liability would be useless in the business’s defense. For example: An employee gets injured on the job due to faulty machinery that should have never been in service. A release of liability is not difficult to obtain nor does it require the necessity of legal representation to acquire such a form. A release of liability should be tailored on a case by case basis, therefore it’s important to have the correct language in a release of liability form that covers the desired protections. The most popular circumstance for wanting a release of liability is when an individual sells a vehicle. The release protects the seller from liability for parking/traffic violations resulting from operation after the sale of the vehicle. Below details the necessary steps needed to take in order to obtain and execute a release of liability when selling a vehicle. Before trying to obtain a release of liability form, check with your state to see if it’s required when selling a vehicle. Like a Bill of Sale, some states do not require a release of liability to be signed and presented to the DMV (however it’s still recommended to have in your records). To make things a little more confusing, some States refer to a release of liability with a different name. For example, when selling a vehicle in Florida, Florida law requires a Notice of Sale which is essentially a release of liability. Once you are certain that a release of liability is required, it’s now time to download or create (recommended) a release of liability to sell your vehicle. If your State provides a method to submit a release of liability, like in the State of California where you can complete a Notice of Transfer and Release of Liability online, it’s highly recommended to use the services provided by your State. It’s always at the decision of the seller to provide a release of liability when completing a transaction. The form should be neatly printed with the correct information included in the document. Lastly, the Releasor (buyer) must sign the document to make it official. With the completed and executed form, it can now be presented to the DMV for processing. Remember, this is a document that every seller should use even if the State does not legally require this document. If you are starting a business that involves physical activity or services, you will want to highly consider creating a document, which in this case is called a Release of Liability, that communicates the message of “proceed at your own risk” to an employee or customer. Activities such as skydiving or rock climbing are high risk services that will require a Release of Liability form to be signed and completed by a customer before such an event can take place. You are hosting an event which has the risk of causing injury to participants due to the physical nature of the activity. Hiring an employee for a job that will demand physical labour (i.e. A Moving Company). The release of liability form frees an individual or entity from responsibility for damages that might arise from a specified activity. This is a general form and may be used in a variety of circumstances. Releases are commonly required for participants in high-risk activities, such as rock climbing or skydiving, but also in conjunction with car or truck rentals, and a range of other activities, events, or transactions that may introduce some risk to life or limb. This contract is a civil arrangement between two parties: the “releasor” who grants the release, and the “releasee” who is freed from liability. It relates only to civil (monetary) damage claims, but has nothing to say about criminal responsibility that might arise from negligence. Even the release from civil liability is conditional on the releasee showing reasonable care – a vendor who rents faulty parachutes or failing vehicles may still face criminal and civil penalties for their malfeasance. The release of liability form waives all present and future claims associated with the specified activity. Usually, this means that the releasor is foregoing the right to claim damages prior to the initiation of the risky activity. So, both releasor and releasee should be clear on the scope of potential risks prior to formalizing the agreement. In some alternative cases, a release may be signed after both activity and damages have occurred – but this is a more complex matter with different legal considerations. Without a release of liability form in hand, liability can be one-sided. Sports vendors, contractors, and others who trade in risky activities may be open to civil claims when incidents occur – even if they do not reasonably seem to be at fault. An outdoor outfitter that rents bikes could be held liable if a patron crashes a rented bicycle, for example. Even though releases are commonplace, legal claims are too. This document should not be viewed as armor against all damage claims. Courts often use a “reasonableness” standard to assess liability – but it can be hard to pin down just what the court thinks is reasonable. Even with a signed release in hand, both parties should do everything possible to prevent untoward outcomes. When a used vehicle is sold, its title is transferred from former to new owner. But what happens if the new owner wrecks the secondhand vehicle or gets ticketed before the formal legal transfer of vehicle ownership? The previous owner may still be held liable – even if the car keys and title have been passed to the purchaser. A simple remedy is to have the purchaser sign a liability release with the vehicle sale. In some jurisdictions, this release is given to the DMV as proof of transaction. But even if not mandated in your state, it is wise to have the purchaser complete a liability release, as it functions as sale documentation and may insulate against future legal complications. This document should include crucial purchase and vehicle details, including the vehicle make, model, color, and year, the vehicle identification number (VIN), the odometer reading, the sale date, and contact information for both parties. In the following example, we take a look at the process of completing a release of liability when selling a used vehicle. First enter the name, address (home or business including the City and State). If the release of liability is from the result of a transaction, include the sale amount ($). When selling a vehicle, the releasee (also known as the “Seller”) must include their name and address. In this event, the release wants to release themselves from liability from their vehicle after the sale. Therefore to do so, a description of the vehicle is mandatory including the Make, License Number, VIN number and the new owner’s name and address. The governing state should be whichever state the Releasee (Seller) had the vehicle registered. The “Executed” date should be the date in which the vehicle was sold. The new Buyer (Releasor) of the vehicle must also include their signature and Printed Name.